Image caption Patricia Drew said she was upset at being "accused of something I didn't do"
An 82-year-old woman accused of illegally pirating a Robert Redford film has received a £600 demand. Copyright holder TCYK LLC claims great-grandmother Patricia Drew, from the Black Country, shared The Company You Keep from her computer. 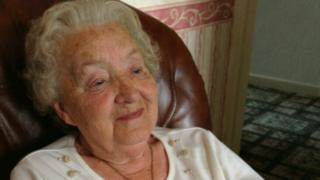 Her daughter-in-law Sheila Drew said the claims were "absurd" as Mrs Drew did not know how to file share. According to the Guardian, TCYK LLC has contacted dozens of Sky broadband customers with similar letters. The letter, received last month, accused Mrs Drew of infringing copyright. It stated she could avoid legal action by accepting liability and paying a settlement of £600. It is the second letter the company has sent to her following initial correspondence in November 2015. Mrs Drew said: "I'm upset to have been accused of something I didn't do... how many other people has this happened to?" The alleged copyright infringement occurred on 25 April 2013 at 02:11 BST, when she was alone at home, her family said. Hatton & Berkeley, which provides financial services to small businesses, sent the letters on behalf of its client TCYK LLC to Mrs Drew. Robert Croucher, managing director of Hatton & Berkeley, said: "They [the letters] are part of what's referred to as a pre-action protocol. We send them before action...They don't actually make a demand for money." In a statement, Sky said: "TCYK LLC successfully applied for a court order against Sky, which means we have been ordered to supply the details of some of our account holders that match the list of IP addresses they have identified." IT expect Craig Sharp said: "Most likely the outcome is that somebody has been able to use her [Mrs Drew's] wi-fi signal."